Soft Coated Wheaten Terrier’s make very playful pets and are best suited in a family fun-loving home. It loves children and can be very playful, so when around small children, it is recommended that the dog is supervised to ensure that it does not get too excited and cause unintentional aggression that may harm the child. If you have other pets in your home, that is not a problem with the Wheaten, as they love to have other dogs and pets in a home. The easiest way to keep up with this breed’s long coat is to clip it about 3 inches from the skin. It requires combing about every other day to ensure that its fur remains smooth and untangled. Loose hair also tends to get caught in the dogs coat causing it to matte up very easily. The brushing will inhibit this from happening as easily and as often. Bathing this breed regularly is also recommended to ensure that its coat remains dirt-free and to keep its coat clean looking after activity. This dog does require a decent amount of daily activity to remain healthy. Long walks or runs are encouraged. Intense games are also another way to ensure that this dog is being exercised. This breed loves to hunt and chase so playing games like fetch are definitely going to keep this terrier occupied. Living outdoors can suit a Soft Coated Wheaten Terrier, however, they thrive much better in an indoor environment with occasional outdoor access. The Soft Coated Wheaten Terrier has its fair share of health concerns. When speaking of its major health concerns, protein losing enteropathy ranks number one on the list. This basically refers to an excessive loss of plasma proteins in the gastrointestinal tract. As for causes of this unfortunate occurrence, they include a tremendous loss of protein into the dog’s abdomen. Non-intestinal causes of hypoproteinemia, specifically relating to the liver or the kidneys, should be excluded as a cause. Symptoms of this disease include extreme weigh loss, emaciation, and even respiratory difficulty caused by fluid accumulation in the chest cavity of the canine. It can be a very serious issue. Chronic Hip Dysplasia is also found in this breed, as is renal Dysplasia. It is important to monitor your Soft Coated Wheaten Terrier’s health to ensure that it is kept healthy. Regular eye and hip screening are recommended. A healthy Soft Coated Wheaten Terrier can live up to 14 years of age on average. 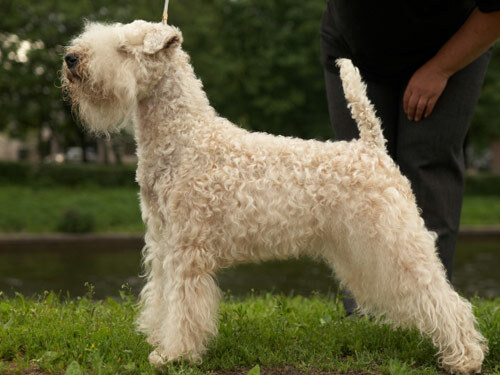 The Soft Coated Wheaten Terrier is one of the three largest terriers in all of Ireland. This dog has served as a farm dog for hundreds of years. The early years of this dogs creation was undocumented and unaccounted for. In the show scene, the Wheaten was late to hit the scene. It wasn’t until 1937 that this breed was considered a real breed in Ireland. The Wheaten came to America for the first time ever in 1946 but it wasn’t until 1973 that the AKC recognized it. This breed, despite its playful nature and hunting skills, only ever reached moderate popularity.